This badge was issued to Scott Sullivan on 17 Oct 2017. 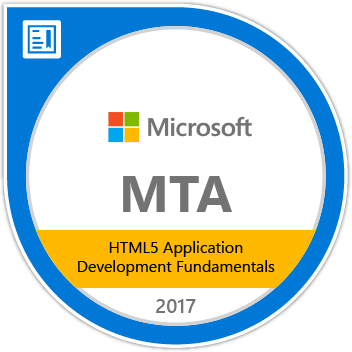 Earners of the MTA: HTML5 Application Development Fundamentals certification have demonstrated core HTML5 client application development skills that will run on today's touch-enabled devices (PCs, tablets, and phones). The MTA program provides an appropriate entry point to a future career in technology.